Though iOS and Android app support offline reading capability, you don’t get to keep the magazines forever though, as the downloaded magazines cannot be exported to saved to other folder location. 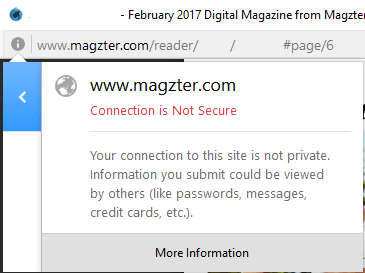 There is no official way that allows Magzter users to save or export magazines, in PDF, picture or eBook format whatsoever. 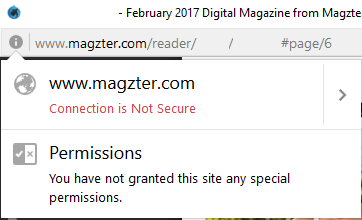 However, there is a workaround to save the magazines from Magzter, by saving the offline images downloaded by Magzter to display the magazine in the web browser. 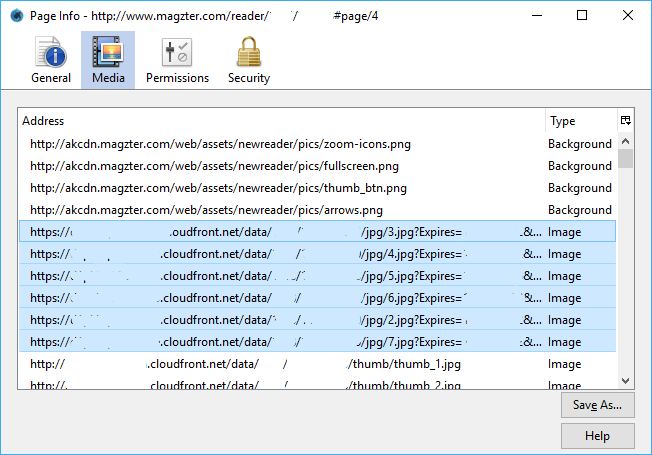 Follow the guide below to learn how to export and save the content of magazine you read in Magzter. Download and install Firefox web browser if you don’t already have it. Vist and login to Magzter. Open the magazine that you want to save a copy. Browse to the page that you want to save a copy. Click or tap on the i icon on the front of the address bar. Then click or tap on the > (right arrow) at the end of the row that specifies “www.magzter.com”. Then, hit the More Information button. In the “Page Info” dialog, go to Media tab. In the list of addresses, look for Image type of files that have ?Expires parameter appended to it. These are the caches of the 6 pages of the magazine that are downloaded and presented by Magzter. The 6 images represent previous, next and current magazine spread that you’re opening now. Select the pages that you want to save, and hit Save As button to select the folder where you want to store the magazine offline. Repeat the steps by browsing to other pages, and save the new images loaded in the Firefox cache. If you want to save the magazine as Acrobat PDF format, you can paste the JPG images into Microsoft Word and then save the document as PDF, or use any other utilities such as PDF merge applications to perform the conversion.